What is the Florida Harbor Pilots Association (FHPA)? The FHPA is a voluntary organization comprised of 11 pilot associations, whose members total 100 highly-skilled and highly-trained harbor pilots that service each of Florida’s 14 deepwater ports. These state-licensed harbor pilots have been taking navigational control of foreign-flagged cargo and cruise ships and directing their movement into and out of Florida’s ports for decades. What do Florida’s harbor pilots do? Florida law mandates that harbor pilots protect to the fullest extent possible Florida’s waters, harbors, ports, environment, life and property, with safety as the primary objective. Harbor pilots act in the public’s interest and maintain independent judgment from economic pressures that may compromise navigational safety. In light of recent events, the role of the harbor pilot is more important than ever. Last year, there were 27,000 individual transits of foreign-flagged cargo and cruise ships on Florida’s waters. On each one was a state-licensed harbor pilot taking charge of the navigational control. Harbor pilots are specially trained in ship handling in Florida’s narrow channels and harbors.They provide a safe, efficient and reliable service by operating and maintaining pilot stations, pilot boats, dispatch systems, electronic navigation and communications equipment and administrative services. What specialized training and education do Florida’s harbor pilots undergo? 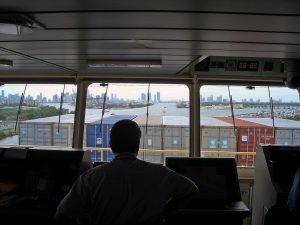 Professional mariners who have the required years of work experience at sea may participate in a nationally competitive deputy pilot exam for a particular port, administered by the Department of Business and Professional Regulation. A successful pilot exam candidate must successfully complete an intense testing and training program overseen by the State Board of Pilot Commissioners that spans from two to more than three years before they become fully qualified to handle all sizes of ships only in that port. During this time frame, harbor pilots complete hundreds or thousands of transits of the port for which they are training. Most harbor pilots in Florida have graduated from a four-year federal or state maritime academy, which are equivalent to the nation’s military academies, demanding a high level of scholastic performance in a military environment. An academy graduate earns a bachelor’s degree and a professional license as Third Mate of unlimited tonnage ships, issued by the U.S. Coast Guard. The professional mariner then leaves his or her family and goes to sea, serving on ocean-going vessels for approximately 10 years, working their way up through increasing levels of responsibility, until the vast majority advance their license to an unlimited master and also sail in command of oceangoing ships. How do harbor pilots benefit the citizens of Florida? The proven system of pilotage protecting the state’s infrastructure investments and the pristine environment comes at no cost to the taxpayer. It is funded by fees paid by the user of Florida’s seaports – the ship owner. Harbor pilots work as a team and possess intimate local knowledge of their ports. Ship captains do not. They represent only their ship owner. Local, state and federal authorities depend on the pilots’ expertise for seaport expansion projects, new ship operations and port security. Without harbor pilots, the lives and safety of Floridians and the protection of the state’s ports and coastal environment would be at risk. Who decides how much a Florida harbor pilot makes? A Florida harbor pilot’s income is based on how much vessel traffic there is in the port. Incomes fluctuate because ship traffic fluctuates.They assume business risk because if ships relocate to other ports, the pilots cannot.Harbor pilots are not employees of the port, the state or the federal government. They are independent, small business owners whose income is derived from the rates charged to the ship owner. The rates are based on the gross tonnage of each ship entering and leaving the ports. Each port has its own rates because each port is unique in geography, infrastructure and navigational challenges. Those rates are set by the Pilotage Rate Review Committee, whose members sit on the full Board of Pilotage Commissioners. All members are appointed by the Governor. Are there any dangerous aspects of a Florida harbor pilot’s job? Yes. They include the unpredictable behavior of thousands of recreational boaters using the same narrow shipping channels as cruise ships and large, deep-draft cargo ships, rapidly changing weather patterns that affect ship handling and the quality of the ships themselves. 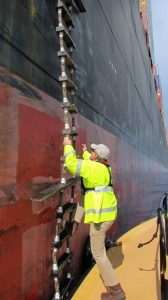 One of the most dangerous times for harbor pilots is transferring to or from the pilot boat on a rope ladder. In a rash of deaths between January 2006 and February 2007, four U.S. pilots and a pilot boat operator were killed during transfers; and, in 2013, a harbor pilot in Panama City, Florida, fell off a rope ladder and tragically drowned. Why aren’t ship captains allowed to pilot their ships? There are several reasons why:harbor pilots exercise independent judgment, as their primary interest is safety, period. Harbor pilots are free of the economic pressures captains may feel from companies seeking to cut costs or maintain schedules, and can make independent assessments on safety precautions, such as the need for hiring tugboats. Ship captains are not intimately familiar with Florida ports. Ship captains do not collectively work as a team like pilots do. They represent the ship owner and do not have the interests of the port or the state in mind. Harbor pilots safely and effectively manage the flow of several ships simultaneously in Florida ports. While ship captains retain command when in pilotage waters, the “conn,” or navigational control, is turned over to the state harbor pilot, as required by Florida law, to transit state waters. The captain’s main responsibility is for his or her own vessel, crew and, in the case of cruise ships, the passengers, and also must comply with operational requirements and pressures from the shipping company. Harbor pilots are responsible for the safety of the vessel which they are navigating, and also with the protection of the state waters, harbors, ports, environment, life and property, including effects that ships transiting a harbor may have on other ships moored at the docks and any impact on port facilities. What is the difference between a state-licensed pilot and a federally-licensed pilot? Harbor pilots in the State of Florida are both state and federally-licensed pilots. State pilotage laws apply to all foreign-flag vessels calling at Florida ports, as well as all U.S. flag vessels engaged in an international voyage. By comparison, federal pilotage laws apply to all U.S. flag vessels engaged in coastwise voyages exclusively between U.S. ports. Federally-licensed harbor pilots may also be contracted to provide services to naval or government vessels, which are exempt from pilotage laws. These exempted vessels almost always hire a state-licensed harbor pilot, because they are the low-cost provider of safety. Federal law requires that a federally-licensed harbor pilot meet the below mandated minimums to be qualified. Pass all parts of an exam, consisting of 20 local knowledge questions (70 percent), 50 “rules of the road” questions (90 percent) and be able to draw the harbor charts (90 percent). Be aboard a vessel for 12 round trips through the port on a ship, 1600 gt or more, as an observer. State law procedures provide for the extensive examination, training and experience to produce the most highly-qualified harbor pilots possible. To not only pass, but have one of the top five scores in a comprehensive deputy pilot exam, consisting of 30 local knowledge questions (70 percent), 100 international “rules of the road” questions (90 percent), 100 inland “rules of the road” questions (90 percent), be able to draw the harbor charts (90 percent), 50 ship handling questions (70 percent), 50 questions on aids to navigation (70 percent), and 50 questions on state and federal regulations (70 percent). Two to three years as a deputy pilot where he/she is trained one-on-one with state harbor pilots. Their performance is observed and evaluated by the state harbor pilots at the port and must be approved by the State Board of Pilot Commissioners that can advance, delay or disqualify the trainee during the training period. After completion of training as a deputy pilot, the candidate must then take an additional state pilot exam, covering the same areas as the original deputy pilot exam, to become a fully-qualified state harbor pilot.